Well, while Cleveland pursues a collective catharsis out East, here in the Bay Area the Warriors and coach Keith Smart will welcome Alvin Gentry’s Suns for a Pacific Division matchup. And neither side is taking a ‘cavalier’ approach to this first meeting of the 2010-11 season. Though the postseason is a ways out, it looks like both teams could very well be among those fighting for one of the final playoff spots in the West based on their current conference standings. Phoenix last played on Sunday when they lost to the host Denver Nuggets 138-133 in the highest scoring game this season in the NBA. Golden State is also coming off of a defeat. They were bested 118-98 by the visiting San Antonio Spurs on Tuesday. However, Golden State had a few bright spots in the lopsided affair to hearten their outlook heading into tonight’s battle. Steph Curry scored 32, and David Lee had 18 points and 7 boards in his second game back after missing an 8-game stretch with an elbow infection, during which time the Warriors went 1-7. The last regular season meeting between these two squads was on March 22nd with Phoenix winning 133-131 in Oakland. 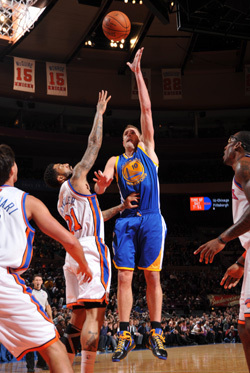 During the 2010 season, the Warriors lost 3 of 4 against the Suns, and have lost 8 of the last 10 overall. Phoenix ranks first in the league in points per game at 109.4. But the flip side of that coin is points allowed at 111.9, which is 30th and last overall in the NBA. Either way you add it up, this evening’s competition should be a high-scoring one. 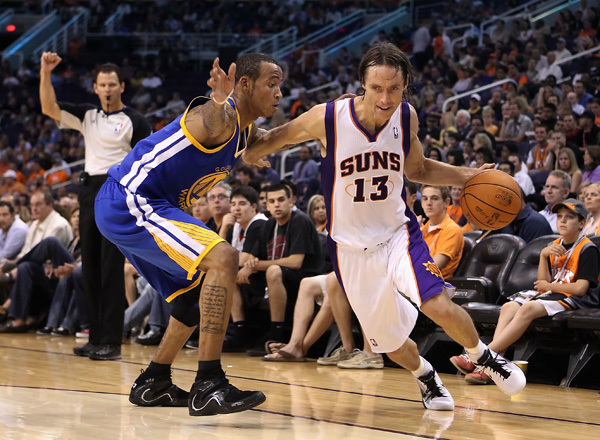 Golden State’s young guns Stephen Curry and Monta Ellis will face Phoenix’s veteran backcourt comprised of Steve Nash and Jason Richardson, who spent his first six years in the league playing for Golden State. Curry and Ellis are averaging a combined total of 45 ppg, while Richardson and Nash are combining for 40 ppg. Part II of tonight’s double-header on TNT gets underway at 10:30 PM ET. Lebron’s hyped-up Heat vs. Cavs homecoming match is sure to get your blood boiling, so stay tuned to the Suns-Warriors afterwards for an up-tempo cool-down brought to you by Kevin Harlan and the Czar.